Apple Pay and Android Pay haven’t exactly conquered the world of payments just yet. A smartphone can replace credit and debit cards in millions of checkout aisles, but that doesn’t mean people will reach for theirs. It’s convenient, but maybe not convenient enough to break an old habit right away. But now, ATMs are starting to learn the same tricks, giving you one more very good reason to ditch your wallet for good. Cardless ATMs are nothing new. Spain has offered them since 2011, and Canadian bank BMO Harris implemented them on a relatively small scale in the United States last March. Yesterday, though, the technology found its most prominent stateside supporter yet in JPMorgan Chase, which will provide “thousands” of cash machines that will require only your smartphone to withdraw from your account. The Chase machines will still work with debit cards, if you so choose. The important thing, though, is that smartphone-only transactions will now be baked into the ATM infrastructure on a large scale. As the processes around those transactions become more available, and more streamlined, you’ll increasingly be able to make physical cards a relic. That convergence has already taken a few different forms, with one commonality: It saves time. And in a few years, it could save even more. There are a few ways to do cardless banking; in fact, Chase itself will pursue two different avenues over the coming year. None of the methods currently in use is totally seamless, but they’re all still faster than fumbling for your card, entering your PIN, poking around the ATM touchscreen, praying you don’t get skimmed, and so on. BMO, which started with 750 Mobile Cash ATMs last March and currently offers the service in all 900 bank-owned cash machines, relies on a QR code system. Customers preload the amount they want to withdraw in the bank’s app, tap Mobile Cash on the ATM display, then hold their smartphone camera up to read a unique QR code generated by the display. That still sounds like a decent amount of legwork, and it is. Even so, it’s a significant improvement over its physical analog, says BMO mobile banking executive Doug Peacock. Important for BMO is that the process also required only a software update to existing ATMs, rather than a more expensive and time-consuming hardware upgrade. Chase, meanwhile, will be approaching cardless ATMs in two waves. The first will, like BMO, be a modestly clunky software solution. Customers can authenticate themselves to their Chase app using either their Chase password or, much more conveniently, their iPhone’s TouchID (Chase doesn’t yet offer the same fingerprint scanner compatibility for Android devices). They’ll then be given a seven-digit access code that will allow them to use the ATM without a card. If that doesn’t sound like the wallet-killer of the future, well, it’s not. And it’s not meant to be. What’s coming next, though, has far more promise. Later this year, Chase will roll out NFC-equipped eATMs, which will allow smartphones to communicate directly with cash machines, making transactions much closer to the frictionless magic that you find using Apple Pay at, say, Walgreen’s. There are security advantages to mobile ATM interactions as well. There’s no card from which skimmers can steal information, or well-worn PINs for hidden cameras to spy. Solutions that incorporate a phone’s fingerprint scanner offer biometric security that, incidentally, won’t be routed through your friendly neighborhood banking conglomerate. It’s not foolproof. There’s not yet a cardless equivalent to the chip-and-pin transactions that are standard in Europe and increasingly commonplace in the US. And as cardless transactions gain in popularity, they will be an increasingly popular target of thieves. Even so, for most people it represents the rare confluence of added security along with added convenience. Sharing codes between phone and ATM, be they QR or numerical, is a stop-gap, full of minor inconveniences of its own that approach those of the debit card it’s trying to replace. It’s not hard to picture an NFC-driven future where an ATM withdraw is as simple as taking out your phone, authenticating with TouchID, and watching your preferred amount of money come out the slot. Chase is already there getting there, although Fusco stressed that the Chase app will continue to be a part of the process. BMO’s Peacock, though, can more easily envision a world in which one can make money appear with the wave of a smartphone. “We would have to upgrade our hardware for NFC,” says Peacock, “but if other institutions had NFC-capable ATMs and we wanted to work on interoperability, we would look at making our Mobile Cash solution work in that fashion.” From there, there aren’t really any major technological hurdles to integration with Apple Pay and Android Pay. That may not be true for much longer, especially if customer convenience really is the goal. In fact, Peacock says, that sort of interoperability could extend not just to other banks but to Apple and Google’s mobile wallets. That’s where the real ease of use happens. It wouldn’t be accurate to say that cardless ATMs will make debit cards obsolete, at least not in any foreseeable timeframe. As Fusco says, they’re an option, with a likely narrow target audience, at least at first. That’s partly a question of equipment. Customers need a smartphone to use them, preferably one with a fingerprint scanner to take advantage of biometric authentication. By this point, though, that’s largely incidental; Peacock estimates that 90 percent of his bank’s customers have the necessary equipment. The bigger hold-up is on the supply side. BMO was a start, and Chase is a major presence, but more institutions will need to sign on before cardless ATMs are anywhere near ubiquitous. And even when they do, they’re unlikely to replace cards completely. Peacock’s a bit more bullish on adoption rates, but still sees slow and steady (and slow) growth as likely. “I think it’s going to take a generational shift,” he says, noting that even a “seismic” change like the advent of mobile deposits—using your smartphone’s camera to deposit a check—still amounts to just 20 percent of deposits. The good news for early adopters, though, is that those inflection points don’t really matter. Over the course of the next year there are going to be thousands more contactless ATMs in the US than there are today. Over the course of the next several, many of those will adopt the convenience of NFC. Before long, you’ll be able to use your phone as a magic money wand, or close enough to it. That may not be enough to boot physical cards from the financial system. 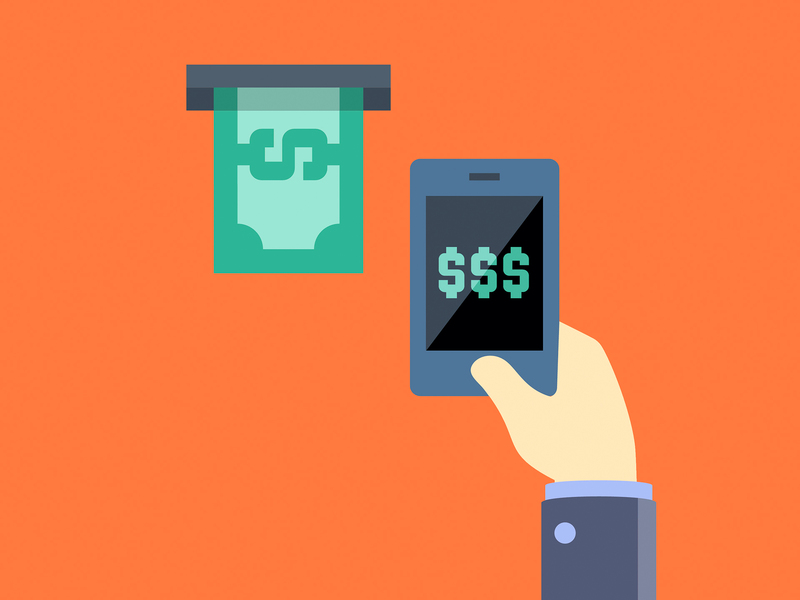 Combined with the propagation of mobile payments, though, it might just be enough to ditch them yourself.